This Saturday 27th December see’s our annual event in memory of our ex Chairman Alan Brown. The game see’s Alan’s and the Club’s Ex Players take on our current Managers & Coaches in what is usually a keenly contested game. Alan’s Ex Players will be defending the Trophy from last years victory under the guidance of Danny Briscoe while the Manages & Coaches will be managed by Matty Stockburn. Kick Off is 1 pm and it would be fantastic to see as many there as possible. After the game the Trophy Presentation and Man of the Match Awards will be conducted in the Clubhouse. See you all there. 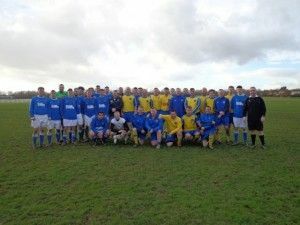 The collective photograph from last years fixture that was won by Alan’s Ex Players managed by Danny Briscoe.